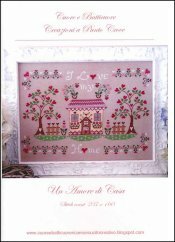 Un Amore Di Casa [W1424] - $12.22 : Yarn Tree, Your wholesale source for cross stitch supplies. Cross stitch pattern by Cuore e Batticuore. A cheerful looking house surrounded by trees, hearts, and flowers/ Stitch count 237 x 160. Stitched on #8291 Belfast Linen Light Mocha.